I have been waxing lyrical about the Slenderella Hooded Wrap to friends and family and not without reason. It is one of the softest and most comfy pieces of housecoat (or dressing gown as some like to call it) that I have ever used. Slenderella who have twice won the award for the UK's best classic nightwear collections sell a range of beautiful lingerie and nightwear. Headquartered in Derbyshire, Slenderella's products are made using the finest natural fabrics and quality yarns and come in a variety of styles. When the opportunity arose to work with Slenderella I was excited and now having used their housecoat over the past couple of weeks, I am even more excited to share my thoughts with you. When the package arrived, I was out travelling, so there was a wait of a few days before I could try them on. But when I returned home, the first thing I did was unpack the package and try on the housecoat and it was so comfy! Made with 100% polyester and with a leaf print, the flannel fleece hooded wrap has a cloudlike softness. It is so fluffy and soft that I feel like I am enveloped in clouds. The fleece material provides blissful warmth and the hood adds a bit of fun and extra protection. There are two patch pockets and the inner hood and cuffs have a solid colour. The housecoat is available in two colours - grey and pink - and I opted for the former. Love the colour! I would score the housecoat top marks both in terms of looks and efficacy. It looks beautiful, feels gorgeous against the skin and the material ensures your natural body heat is preserved. 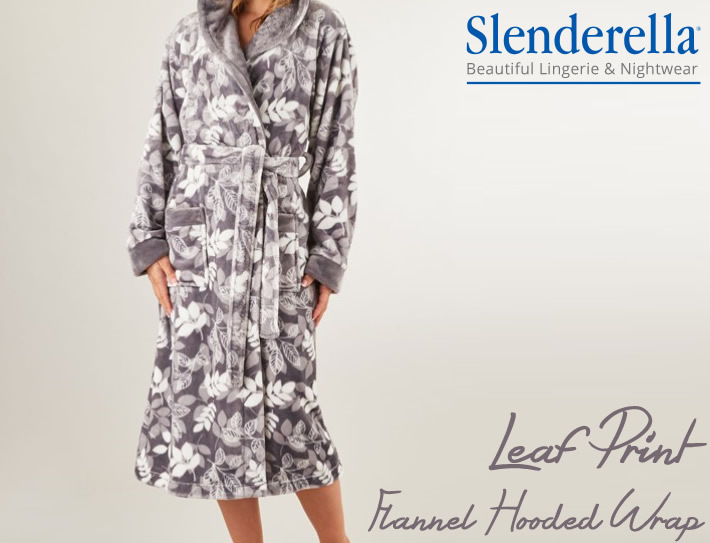 If you are looking for a housecoat that looks stylish and offers pure comfort, then I cannot recommend the Slenderella Hooded Wrap enough. The housecoat is priced at £41.00 which I think is a good price if you take into consideration the excellent quality of the product. Like I mentioned earlier, I have never worn anything so comfortable!